Objective: In Australian residential aged care facilities (RACFs), the use of certain classes of high-risk medication such as antipsychotics, potent analgesics, and sedatives is high. Here, we examined the prescribed medications and subsequent changes recommended by geriatricians during comprehensive geriatric consultations provided to residents of RACFs via videoconference. Design: This is a prospective observational study. Setting: Four RACFs in Queensland, Australia, are included. Participants: A total of 153 residents referred by general practitioners for comprehensive assessment by geriatricians delivered by video-consultation. Results: Residents’ mean (standard deviation, SD) age was 83.0 (8.1) years and 64.1% were female. They had multiple comorbidities (mean 6), high levels of dependency, and were prescribed a mean (SD) of 9.6 (4.2) regular medications. Ninety-one percent of patients were taking five or more medications daily. Of total medications prescribed (n=1,469), geriatricians recommended withdrawal of 9.8% (n=145) and dose alteration of 3.5% (n=51). New medications were initiated in 47.7% (n=73) patients. Of the 10.3% (n=151) medications considered as high risk, 17.2% were stopped and dose altered in 2.6%. Conclusion: There was a moderate prevalence of potentially inappropriate high-risk medications. However, geriatricians made relatively few changes, suggesting either that, on balance, prescription of these medications was appropriate or, because of other factors, there was a reluctance to adjust medications. A structured medication review using an algorithm for withdrawing medications of high disutility might help optimize medications in frail patients. Further research, including a broader survey, is required to understand these dynamics. Despite the growing body of literature indicating that medication errors and potentially inappropriate medications are important causes of morbidity and mortality, evidence for effective interventions and strategies to improve the pharmacological management of patients is still limited.8 Well-organized approaches are needed to provide specialist advice in nursing homes to ensure quality medical care. Practice models that include a pharmacist as part of the multidisciplinary team represent best practice in inpatient, ambulatory, and community settings, and in care transitions between settings.9 Geriatrician-led case conference reviews and comprehensive geriatric assessments (CGAs) have been shown to be effective in reducing potentially inappropriate medications use and improved suboptimal prescribing.7,10 Although access to geriatric services in Australian RACFs is limited, expert advice is increasingly provided by videoconferencing (VC). In the model offered in relation to this study, a specialist geriatrician provides a comprehensive assessment of the patient and input into care plans via VC. Geriatricians make recommendation about patients’ medications, perhaps advising that some medications are stopped or others commenced. We designed this study to examine whether VC-mediated geriatric assessment resulted in changes to medications prescribed, and reduced the prevalence of potentially inappropriate medication use. We conducted a prospective observational cohort study of four RACFs in Queensland, Australia, that currently have regular access to geriatric consultations via VC. The participating facilities were the first four to be supported by the geriatrician service operating out of the Centre for Research in Geriatric Medicine. We were able to record the information for 153 patients assessed by four geriatricians over the research timeframe. At participating facilities, geriatrician-supported CGA is encouraged within 4–12 weeks of admission. All residents are offered CGA at entry into the participating RACF. However, uptake is determined by referral from the treating general practitioners. The CGA is conducted using a structured protocol based on the interRAI (Resident Assessment Instrument) Long-Term Facility assessment system, administered by a senior registered nurse. The assessment includes a comprehensive diagnosis list, justification of all medications documented, functional profile, cognitive assessment confirming the presence or absence of cognitive and mood disorders, recommendations for prevention and management, and advanced care planning. Observations made by the nurse are entered into a clinical decision support system, which generates a draft resident health care profile and care plan. The clinical decision support system is mounted on a web-based platform to permit review and comment by a specialist geriatrician. interRAI is a not-for-profit research consortium with international collaboration from more than 30 countries that aims to improve the quality of life of vulnerable persons through a unified comprehensive assessment system. Ideally, 1–4 weeks following admission to the facility, residents who have been referred to a geriatrician by the GP are assessed via video-consultation by the specialist. The geriatrician is able to speak with the resident as well as attending RACF staff and resident’s family members if present. Recommendations to the GP and RACF are made, as necessary, regarding the resident’s care plan following the consultation. CGA is also offered to existing residents on an “as needs” basis. A formal functional profile is prepared, and a report is generated recording the recommendations made by the geriatrician. Data for this study were retrieved from these sources over an 18-month period from January 2013 to August 2014. Ethics approval was obtained from the University of Queensland Medical Research Ethics Committee. All patients or their substitute decision-maker gave informed consent for participation. The primary outcome measure was the appropriateness of prescribing. A high-risk medications list was created based on those recognized by the American Geriatric Society 2012 Beers Criteria,11 the McLeod criteria,12 the Laroche criteria,13 the PRISCUS criteria,14 and the Norwegian General Practice criteria15 (Table 1). These criteria consider a medication as high risk when it has a tendency to cause adverse drug events and drug toxicity in older adults due to its pharmacological properties and the physiologic changes of aging. For our study, we defined high-risk medications as those that are listed on any one of these criteria. We excluded medications not available in Australia. Polypharmacy status was categorized into three groups based on the number of medications prescribed: non-polypharmacy (0–4 medications), polypharmacy (5–9 medications), and hyper-polypharmacy (≥10 medications).16 Complementary and as-required medications were excluded. Three levels of change on current prescription were defined as drug stopped, dose altered, and new drug started. Abbreviations: ATC, anatomical therapeutic chemical; COPD, chronic obstructive pulmonary disease; CNS, central nervous system; ECG, electrocardiogram; MAO, monoamine oxidase; NSAID, non-steroidal anti-inflammatory drugs; SSRI, selective serotonin reuptake inhibitors; TCA, tricyclic antidepressants. The Statistical Package for Social Science 21.0 (IBM SPSS Statistics 21. Ink) was used for statistical analysis. Categorical variables were summarized using proportions and continuous variables using mean, standard deviation (SD), and range. In univariate analysis, the differences in the distribution of variables between patients with or without high-risk medications were compared using the chi-squared test for categorical variables, and nonparametric or parametric comparison of means for continuous variables, depending on the distribution of the data. Tests of significance were two-tailed, using a significance level of P≤0.05. Over the course of the study, 153 patients were assessed by the four participating geriatricians across four facilities. Demographics and clinical characteristics of the study population are presented in Table 2. The mean (± SD) patient age was 83.0 (±8.1) years and 64.1% were female. The median length of stay in the facility at the time of assessment was 488 days (range 6–3,213 days). Twenty-four percent of patients were assessed within 12 weeks of admission to the facility. Patients had multiple comorbidities (mean 6), including dementia diagnosed in 67.3%, depression in 46.4%, and delirium in 11.7%. Other prevalent comorbidities were hypertension (35.9%), diabetes (20.9%), heart diseases (13.7%), and respiratory diseases (11.1%). Patients were prescribed a mean (± SD) of 9.6 (±4.2) regular medications. Polypharmacy (≥5 medications) was seen in 91% (n=139) residents, half of whom (n=69) were exposed to hyper-polypharmacy (≥10 medications). Abbreviations: COPD, chronic obstructive pulmonary disease; IQR, interquartile range; SD, standard deviation. Of all medications prescribed (n=1,469), the geriatrician recommended withdrawal of 9.8% (n=145) and dose alteration for 3.5% (n=51) medications. Medications were stopped because of adverse effects (n=66), no clear indication/medication burden (n=63), and disease cured (n=16). Similarly, the medication dose was altered because of adverse effects and other factors (n=36), changed to “as required” (n=5), and ineffective dose (n=10). New medications were initiated in 47.7% (n=73) patients (Table 3). High-risk medications prescribed (10.3%; n=151) and intervention by geriatricians are listed by drug classes in Table 4. At least one high-risk medication was prescribed to 58.2% (n=89) patients. The univariate analysis showed that the length of stay was the only variable significantly associated with patients having at least one high-risk medication (Table 5). Of the high-risk medications, the geriatrician ceased 17.2% (n=26) medications and altered the dose in 2.6% (n=4). 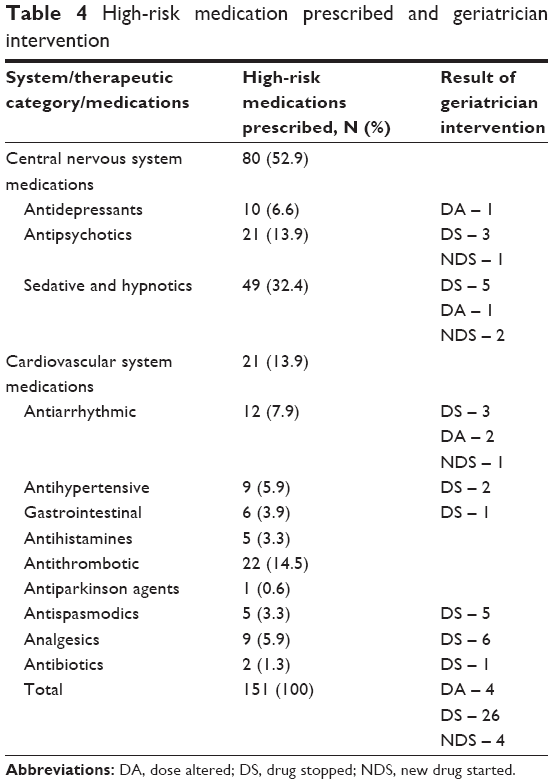 High-risk medications stopped were analgesics (n=6), antispasmodics (n=5), sedative and hypnotics (n=5), antipsychotics (n=3), antiarrhythmic (n=3), antihypertensive (n=2), gastrointestinal medications (n=1), and antibiotics (n=1). The dose was altered for antiarrhythmic (n=2), antidepressants (n=1), and sedative and hypnotics (n=1). Notes: Total medication prescribed: 1,469; total high-risk medications prescribed: 151 (10.3%). Abbreviations: DA, dose altered; DS, drug stopped; NDS, new drug started. Note: Values represent frequency (% of n). To our knowledge, this is the first study of a geriatrician intervention where the medication advice for residents at long-term residential care facilities was specifically assessed via video-consultation. We found moderate levels of high-risk medications prescribed to residents in RACFs. Geriatricians made relatively few changes. This suggests that either the prescription of these medications was appropriate or other factors influenced the decision not to adjust medications. Optimizing prescribing requires appropriate ways to taper or withdraw high-risk medications in older adults. Available explicit and implicit criteria for appropriate prescribing encompass medications that have been validated in, and applied to, robust, healthy populations aged 65 and older. Therefore, these approaches may not be applicable to the more frail and multimorbid oldest old who reside in RACFs.24 Most attention has been paid to the development of guidelines on how to initiate medications, but there are limited studies on the most effective way to cease medications.25,26 Barriers to cease medications include time constraints on medical practitioners. This had led some to advocate that there should be some systematic approaches to follow in ceasing medications.27,28 In responding to polypharmacy and minimizing high-risk medications, there appears a need for a practical algorithm that helps clinicians identify and discontinue potentially inappropriate high-risk medications using a systematic approach. This algorithm should signify a range of different clinical scenarios in relation to high-risk medications and offer an evidence-based approach to identify and, if appropriate, discontinue such medications and/or suggesting alternative treatments when required. Our study has several limitations. Although, combining five different explicit criteria gives us an opportunity to extract a comprehensive list of high-risk medications, this list is not meant to regulate practice in a manner that surpasses the clinical judgment and the assessment of a prescriber. Also, because of our definition of high-risk medications as a list of drugs, the further domains of inappropriate prescribing such as underuse of medications and drug–drug interaction might be missed. Any adverse health events occurring among the residents using high-risk medications were also not investigated in our study. Considering the small sample size of 153 patients, the study results may not be representative of larger sample size in different nursing home settings. In this study of 153 residents of four RACFs, we found a moderate prevalence of potentially inappropriate high-risk medications. However, geriatricians made relatively few changes, suggesting either that, on balance, prescription of these medications was appropriate or, because of other factors, there was a reluctance to adjust medications. Further research, including a broader survey, is required to understand these dynamics. A structured medication review using an algorithm for withdrawing medications of high disutility might help optimize medication prescribing in frail older people. The authors would like to thank Elena Klestov and Eamonn Eeles, participating geriatricians for their support during the video-consultation; Melinda Martin Khan, research fellow in Centre for Research in Geriatric Medicine, for her help in ethics application; and staffs in Masonic Care Queensland for their assistance in data collection phase of this study. An abstract of preliminary study results on the first 75 patients was accepted as a poster in British Geriatrics Society (BGS) Autumn Meeting 2014, 15–17th October, Brighton, UK. Australian Bureau of Statistics (ABS) [database on the Internet]. Reflecting a Nation: Stories from the 2011 Census, 2012–2013, cat. no. 2071.0. Canberra: ABS; 2013. Available from: http://www.abs.gov.au/ausstats/abs@.nsf/Latestproducts/2071.0Main%20Features602012%E2%80%932013?opendocument&tabname=Summary&prodno=2071.0&issue=2012%E2%80%932013&num=&view. Accessed November 27, 2014. Burns E, McQuillan N. Prescribing in care homes: the role of the geriatrician. Ther Adv Chronic Dis. 2011;2(6):353–358. Gnjidic D, Hilmer SN, Blyth FM, et al. Polypharmacy cutoff and outcomes: five or more medicines were used to identify community-dwelling older men at risk of different adverse outcomes. J Clin Epidemiol. 2012;65(9):989–995. Stafford AC, Alswayan MS, Tenni PC. Inappropriate prescribing in older residents of Australian care homes. J Clin Pharm Ther. 2011; 36(1):33–44. Snowdon J, Day S, Baker W. Audits of medication use in Sydney nursing homes. Age Ageing. 2006;35(4):403–408. Wilson NM, Hilmer SN, March LM, et al. Associations between drug burden index and falls in older people in residential aged care. J Am Geriatr Soc. 2011;59(5):875–880. Crotty M, Halbert J, Rowett D, et al. An outreach geriatric medication advisory service in residential aged care: a randomised controlled trial of case conferencing. Age Ageing. 2004;33(6):612–617. Howard R, Avery T. Inappropriate prescribing in older people. Age Ageing. 2004;33(6):530–532. Sen S, Bowen JF, Ganetsky VS, et al. Pharmacists implementing transitions of care in inpatient, ambulatory and community practice settings. Pharm Pract (Granada). 2014;12(2):439. Kaur S, Mitchell G, Vitetta L, Roberts MS. Interventions that can reduce inappropriate prescribing in the elderly: a systematic review. Drugs Aging. 2009;26(12):1013–1028. American Geriatrics Society 2012 Beers Criteria Update Expert Panel. American Geriatrics Society updated Beers Criteria for potentially inappropriate medication use in older adults. J Am Geriatr Soc. 2012; 60(4):616–631. McLeod PJ, Huang AR, Tamblyn RM, Gayton DC. Defining inappropriate practices in prescribing for elderly people: a national consensus panel. Can Med Assoc J. 1997;156(3):385–391. Laroche ML, Charmes JP, Merle L. Potentially inappropriate medications in the elderly: a French consensus panel list. Eur J Clin Pharmacol. 2007;63(8):725–731. Holt S, Schmiedl S, Thurmann PA. Potentially inappropriate medications in the elderly: the PRISCUS list. Dtsch Arztebl Int. 2010; 107(31–32):543–551. Rognstad S, Brekke M, Fetveit A, Spigset O, Wyller TB, Straand J. The Norwegian General Practice (NORGEP) criteria for assessing potentially inappropriate prescriptions to elderly patients. A modified Delphi study. Scand J Prim Health Care. 2009;27(3):153–159. Onder G, Liperoti R, Fialova D, et al. 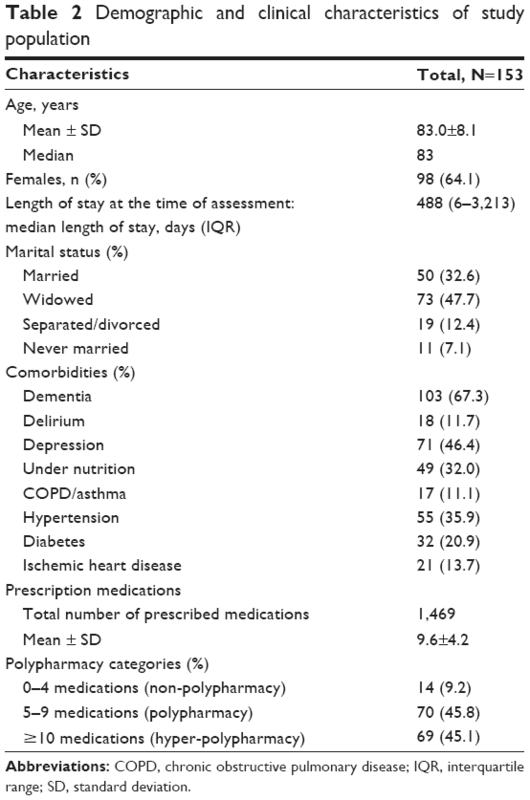 Polypharmacy in nursing home in Europe: results from the SHELTER study. J Gerontol A Biol Sci Med Sci. 2012;67(6):698–704. Goldschlager N, Epstein AE, Naccarelli GV, et al. A practical guide for clinicians who treat patients with amiodarone: 2007. Heart Rhythm. 2007;4(9):1250–1259. Scott IA, Anderson K, Freeman CR, Stowasser DA. First do no harm: a real need to deprescribe in older patients. Med J Aust. 2014; 201(7):390–392. Allard J, Hebert R, Rioux M, Asselin J, Voyer L. Efficacy of a clinical medication review on the number of potentially inappropriate prescriptions prescribed for community-dwelling elderly people. CMAJ. 2001;164(9):1291–1296. King MA, Roberts MS. Multidisciplinary case conference reviews: improving outcomes for nursing home residents, carers and health professionals. Pharm World Sci. 2001;23(2):41–45. Spinewine A, Swine C, Dhillon S, et al. Effect of a collaborative approach on the quality of prescribing for geriatric inpatients: a randomized, controlled trial. J Am Geriatr Soc. 2007;55(5):658–665. Kaboli PJ, Hoth AB, McClimon BJ, Schnipper JL. Clinical pharmacists and inpatient medical care: a systematic review. Arch Intern Med. 2006; 166(9):955–964. Crotty M, Rowett D, Spurling L, Giles LC, Phillips PA. Does the addition of a pharmacist transition coordinator improve evidence-based medication management and health outcomes in older adults moving from the hospital to a long-term care facility? Results of a randomized, controlled trial. Am J Geriatr Pharmacother. 2004;2(4):257–264. Poudel A, Hubbard RE, Nissen L, Mitchell C. Frailty: a key indicator to minimize inappropriate medication in older people. QJM. 2013; 106(10):969–975. Bain KT, Holmes HM, Beers MH, Maio V, Handler SM, Pauker SG. Discontinuing medications: a novel approach for revising the prescribing stage of the medication-use process. J Am Geriatr Soc. 2008; 56(10):1946–1952. Wong IC, Asherson P, Bilbow A, et al. Cessation of attention deficit hyperactivity disorder drugs in the young (CADDY) – a pharmacoepidemiological and qualitative study. Health Technol Assess. 2009; 13(50):iii–iv, ix–xi, 1–120. Hamdy RC, Moore SW, Whalen K, et al. Reducing polypharmacy in extended care. South Med J. 1995;88(5):534–538. Raghunath AS, Hungin AP, Cornford CS, Featherstone V. Use of proton pump inhibitors: an exploration of the attitudes, knowledge and perceptions of general practitioners. Digestion. 2005;72(4):212–218.